Consul General Zheng said that the city regeneration projects of Salford Quays and Media City was the earliest and largest ones in the UK, which could inspire economic transformation and the revitalization of old industrial bases in China. Paintings by Lowry, the famous Salford artist, reflect life of workers after the industrial revolution and are well received by Chinese audiences. The Lowry, named after the artist, is an ideal venue for hosting all kinds of international cultural events. Salford Dragon Boat Festival organized by local Chinese communities at Salford Quays has become more influential over the years and become one of the local annual celebrations. The Chinese garden built by the Royal Botanical Society in Bridgewater Garden in Salford gained positive following from departments in garden design in China and strong support from local Chinese communities. 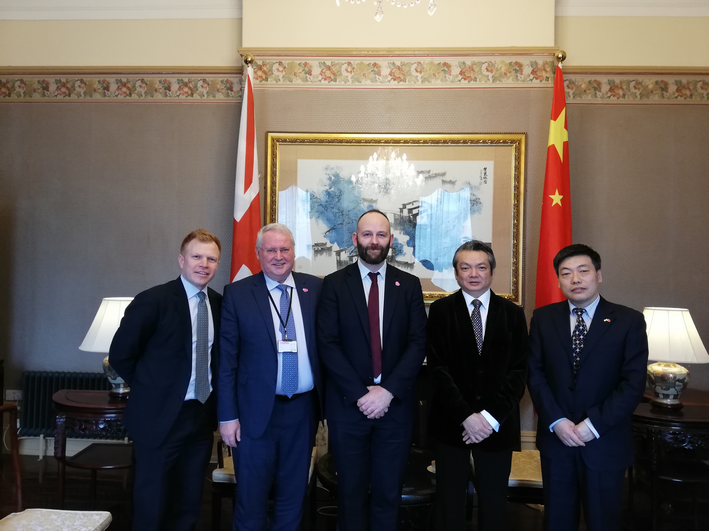 He pointed out that there are bright prospects for Salford to carrry out exchange and cooperation in various areas with China and hoped that Mayor Dennett would actively expand friendly exchanges with China and achieve win-win results in cooperation. Mayor Dennett thanked the Consulate General for its active efforts in highlighting Salford's profile in China and coordinating exchange and cooperation in various areas. He appreciated the crucial contribution made by local Chinese communities to social welfare, and said that as a birthplace of industrial revolutions, Salford at the moment is actively exploring how to conform to and continue to lead the fourth industrial revolution. Regarding England's local development strategies, Salford fully acknowledges the significance of executing active international cooperation especially with emerging economies, such as China, and is willing to establish exchange with China to learn from each other and gain complementary advantages.